Growing Up in the 50’s: Bomb Scare! Like most suburban houses built in the 50’s, ours had a stairway to the basement in the center of the house. Under the stairway was an empty space with progressively lower head room, since the ceiling was in fact the stairs. My father used this space to build a closet. It was closed in with a shiny, highly varnished wood and the door had black cast iron hinges and handle. It was about 5 feet wide and probably 8-10 feet long. You could enter and stand for maybe 4 or 5 feet after which the amount of vertical space rapidly declined. Both side walls were lined with shelves. On the surface the purpose of this space was food storage. Stuff that we bought in bulk to save money. Stuff that didn’t fit in the kitchen cabinets. Stuff that we prepared while in season to enjoy during the long off-season. We weren’t importing strawberries from California, cherries from Washington or plums from Chile at the time, so you either figured out a way to preserve this stuff or you waited until next summer. I remember the storage closet being full of mason jars of peaches that my mom packed in August. She may have done tomatoes too, but I primarily remember the peaches because they were delicious. But food storage was only a fringe benefit of recovering this space from under the stairs. The real value of this underground hideaway is that this was to be our salvation when they dropped the big one. They , of course, were the Russians. And the big one was some sort of atomic, nuclear, radioactive bomb that no one doubted the dirty Commies would use to obliterate Totowa, N.J., and its environs. So we kept a couple of gallon sized glass jugs of water there that we changed out sporadically. I suspect that Dad also slipped in a couple jugs of the cheap vin rose that he bought by the half-gallon. 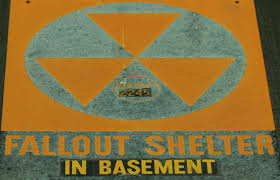 Hopefully he did not have a stash of his cigars in the our bomb shelter because the jury is out on whether nuclear fallout is in fact more or less toxic that being in a closed space while my father toked on his cigars. The food that I remember being there included cans of Spam and cans of Campbell’s condensed soup. Not sure whether Dad thought to leave a can opener and I don’t remember any stockpile of utensils. So I suspect saving ourselves from the holocaust outside would have involved having Dad take out his pocketknife, hack open a can of Campbell’s condensed navy bean soup and having us scoop out that sludge with our fingers. Another possible missing item was a communications device. If we are sitting in our basement oasis waiting for the air to clear of Krushchev’s red poison, how do we get the all clear signal? What if we step out too soon and get disintegrated. Who wants to spend the last day of their life eating cold Spam out of the can while watching their father get plastered on rotgut wine? In retrospect I think I would have grabbed a jar of Mom’s peaches and taken my chances under a tree in the backyard. This entry was posted in Growing Up in the 50s, History and tagged 50's, bomb shelter, history. Bookmark the permalink. 3 Responses to Growing Up in the 50’s: Bomb Scare! Hi ken. This us Cathy’s sister , Liz Sullivan. (Betty Betsy).she shared this with me. Great stories that bring back memories of my aunt and uncle. I had no idea the closet was for any purpose other than food storage! I do remember the peaches were terrific.